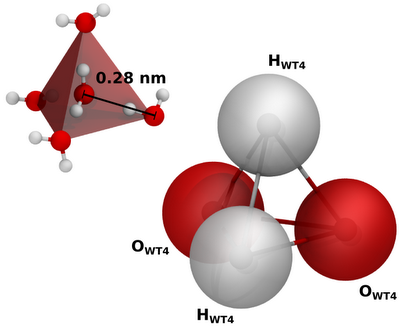 A CG Model for Aqueous Solvation: WAT FOUR? The accurate description of solvation properties is a challenging task for CG models. We have developed a CG model based on the transient tetrahedral structures observed in pure water. Our representation lumps approximately 11 WATer molecules into FOUR tetrahedrally interconnected beads. Each bead carries a partial charge allowing the model to explicitly consider long-range electrostatics via PME, generating its own dielectric permittivity and obviating the shortcomings of a uniform dielectric constant. This allows for an accurate representation of Debye and Bjerrum lengths and solvation structures. We obtained a very good representation of the aqueous environment for most biologically relevant temperature conditions in the range from 278 to 328 K.
The model is applied to solvate simple CG electrolytes developed in this work (Na+, K+, and Cl-) and our simplified model of nucleic acids. The solvation structure around DNA, partial charge neutralization by counterions, preference for sodium over potassium, and ion mediated minor groove narrowing as reported from X-ray crystallography are remarkably well reproduced by the present scheme. The WT4 model opens the possibility of reaching the multimicroseconds time scale, including explicit solvation, ionic specificity and long-range electrostatics, keeping nearly atomistic resolution with significantly reduced computational cost.